The Pacsafe RFIDsafe W75 is a RFID blocking pouch. 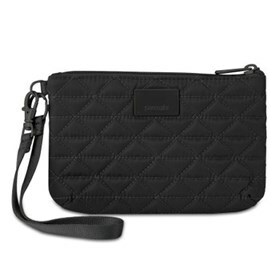 This roomy pouch keeps cash, coins, keys, passport and lip gloss all in one, safe, secure in stylish place. You can simply attach it to your bag or clutch and say goodbye to rummaging around trying to find those essentials. Pacsafe's RFIDsafe W75 pouch has detachable strap that can be secured around the wrist or attached to the inside of the bag. The pouch has 3 cards slots, key / wallet clip, outer zippered coin pocket, coin / card divider in main compartment. It is constructed of durable nylon and made of RFIDsafe blocking material to block frequencies of 10MHz - 3GHz, preventing thieves from downloading all of your personal information stored in your RFID chip on your credit card. 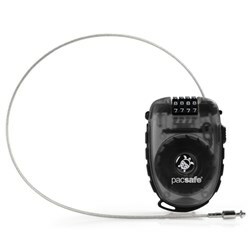 Strap Length : 6.69" - 13.39"
The Pacsafe RFIDsafe W75-Black has many exciting features for users of all types. It's one of FactoryOutletStore's best selling . FactoryOutletStore stocks a full line of accessories like 4 Dial Retractable Cable Lock and Combination Lock for the Pacsafe RFIDsafe W75-Black. 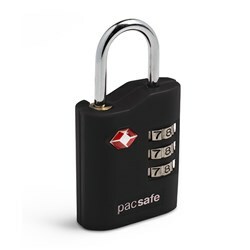 The Pacsafe RFIDsafe W75-Black is sold as a Brand New Unopened Item.